The MOLLE II molded waist belt has no longer a female connector into which the MOLLE frame joins but straps (6) and buckles (7) to attach it to the MOLLE II frame. The waist belt is designed to be permanently attached to the frame and to distribute part of the main pack or large rucksack load to the hips. The molded waist belt is constructed of a molded foam pattern, covered in textured nylon duck, conforming to MIL-C-43734 (2), an inner plastic reinforcement and edged with 1-inch binding tape conforming to MIL-T-5038 (4). An outer reinforcement covered with textured nylon duck (2) is sewn to the rear of the belt and onto the inner plastic reinforcement (3). Two rear mounting straps of 1-inch-wide webbing conforming to MIL-T-5038 (6) are sewn onto the outer plastic reinforcement (5). Two attachment straps of the same material are sewn to the center of the rear mounting straps (6) to secure two each 1-inch tension locks (Duraflex PN 5425) (7). In addition, two lengths of 1-inch webbing are sewn to each side of the belt for equipment attachment. Two lengths of 2-inch-wide webbing conforming to MIL-W-17337 (8) are sewn to the outer ends of the inner plastic reinforcement (3). Male and female ends of a 2-inch side release buckle (Duraflex PN 5432) (9) are attached to the 2-inch webbing belt (8). 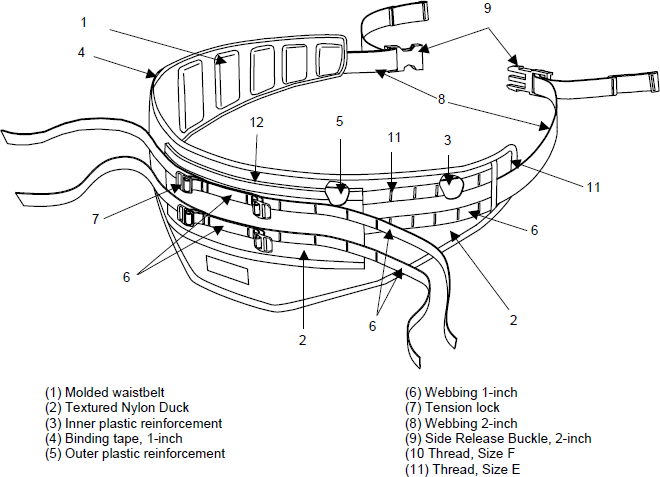 The waist belt is constructed using Size F Thread conforming to V-T-295 (10). Bartacking and binding tape attachment requires Size E Thread (11).